Description: - Merritt Hill Country offers a spacious studio floor plan with a large walk-in shower and full-size washer and dryer connections in Dripping Springs, TX. 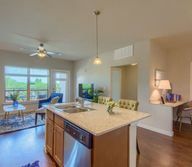 Description: Our senior community in Dripping Springs, TX offers the best of senior living and features a one bedroom luxury apartment with a gourmet kitchen. Description: This spacious one bedroom, one bath senior apartment in Dripping Springs, TX offers an open floor plan and a private patio/balcony area with additional storage. Description: With a full master suite with an en suite bath which offers dual vanities, you�ll love calling this one bedroom luxury apartment your new West Austin area home. Description: Featuring a gorgeous kitchen with an island/breakfast bar, granite countertops, and faux wood flooring, this luxury two bedroom, one bath senior apartment home in Dripping Springs, TX was designed with your comfort in mind. Description: Enjoy watching beautiful Dripping Springs sunrises and sunsets from the private patio/balcony of this luxury senior apartment at Merritt Hill Country. Description: With additional storage closets and a built-in desk, this two bedroom, two bath floor plan makes it simple to stay organized. Description: This two bedroom, two bath Merritt Hill Country Senior Apartment offers ceiling fans in the living room and bedrooms, a spacious in-kitchen pantry, and an open concept floor plan.